Sunshine Radiology, LLC (“Sunshine”) has been acquired by The Physician Services business of Envision Healthcare (NYSE: EVHC), marking the fourth physician group that has joined Envision Healthcare in the past 30 days. Sunshine is a leading subspecialized radiology group in Central Florida currently providing services to nine hospitals, eight breast centers, and one hospital-owned outpatient imaging center in the greater Tampa marketplace. 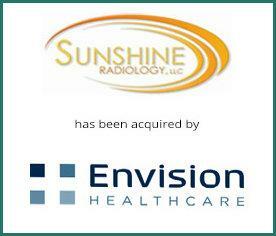 Provident Healthcare Partners served as exclusive financial advisor to Sunshine Radiology. The terms of the transaction were not disclosed. Founded in 2008 by Dr. David Rippe, Dr. Ronald Prati, and Roberta Cove, Sunshine Radiology is comprised of 35 board-certified radiologists and offers a wide array of diagnostic and interventional procedures as the exclusive provider of professional radiology services to Florida Hospital West Region, which is a division of Adventist Health System, one of the largest not-for-profit health systems in the United States. Envision Healthcare Corporation is a leading provider of physician-led services, ambulatory surgery center management, post-acute care and medical transportation. Physician-led services encompass providers at more than 780 hospitals in 45 states and include leadership positions in emergency department and hospitalist services, anesthesiology, radiology, and women’s and children’s services, as well as offerings in general surgery and office-based medicine. As a market leader in ambulatory surgical care, the company owns and operates 260 surgery centers and one surgical hospital in 35 states and the District of Columbia, with medical specialties ranging from gastroenterology to ophthalmology and orthopedics. Post-acute care is delivered through an array of clinical professionals and integrated technologies designed to contribute to efficient and effective population health management strategies. As a leader in healthcare transportation services, the company operates in 39 states and the District of Columbia. In total, the company offers a differentiated suite of clinical solutions on a national scale, creating value for health systems, payors, providers and patients. For additional information, visit www.evhc.net. Provident is the leading investment banking firm specializing in merger and acquisition advisory, strategic planning, and capital formation for middle-market and emerging growth healthcare companies. Within physician services in particular, Provident has successfully closed over 20 transactions on behalf of physician group clients since the beginning of 2015. The firm has a vast network of high-level, senior industry contacts, a thorough knowledge of market sectors and specialties, and unsurpassed experience and insight into the M&A process. Provident uncovers value and opportunities that others often overlook to create transaction premiums for its clients. For more information, visit the Provident website www.providenthp.com.